Building 3 of The Center at Needham Ranch has officially gone vertical, with the raising of the walls now underway. 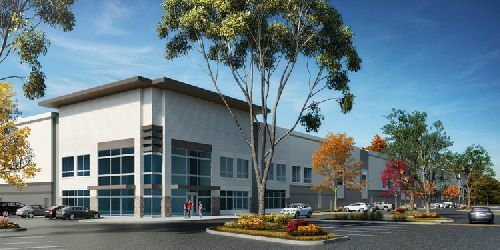 The project is a development of Trammell Crow Company and Clarion Partners LLC, who will also soon be commencing construction of the final three buildings in the first phase of the project. Building 3 of The Center at Needham Ranch is comprised of a 212.2k sf, concrete tilt-up industrial building situated on a 12.2-acre parcel fronting along Sierra Hwy, overlooking the 14 Fwy at Newhall Ave, one mile north from I-5. Featuring 36-foot interior clear height, ESFR fire sprinklers, 21 dock-high loading positions and up to 300 vehicle parking spaces, the building is expected to be ready for occupancy in early 4Q 2019. The Center at Needham Ranch Phase 1 is an approximately 900k sf Class A industrial park, which offers buildings ranging from approximately 67.6k sf to 212.2k sf on a 52 net-acre site. State-of-the-art features in all the buildings in the project include: 30-to-36-foot interior clear heights with ESFR fire sprinklers, abundant dock high loading with large truck courts and yard areas, attractive architectural design featuring extensive use of glass, and abundant vehicle parking with capacity for above standard parking counts. Construction will commence on the final l buildings in Phase 1 comprised of three Class A industrial buildings of 97.4k sf, 126.4k sf and 194.2k sf with up to 3.5/1000 car parking to accommodate manufacturing, corporate headquarters, research and development and last mile fulfillment uses and will be ready for occupancy in early 1Q 2020. The Center at Needham Ranch is a master-planned, 132 net-acre industrial development located immediately adjacent to the San Fernando Valley approximately one mile north of Interstate 5 adjacent to Highway 14, providing immediate access to the San Fernando Valley and greater Los Angeles region with more than 5 million people within a 30-minute commute. Sitting at the southern entrance to the City of Santa Clarita, the development is ideally situated for “last mile” and regional distribution, studio and entertainment uses, manufacturing, research and development and corporate office uses. You can learn – and see -- more about The Center at Needham Ranch by viewing an exciting video short about the development on RENTV. Simply go to our home page at www.rentv.com.